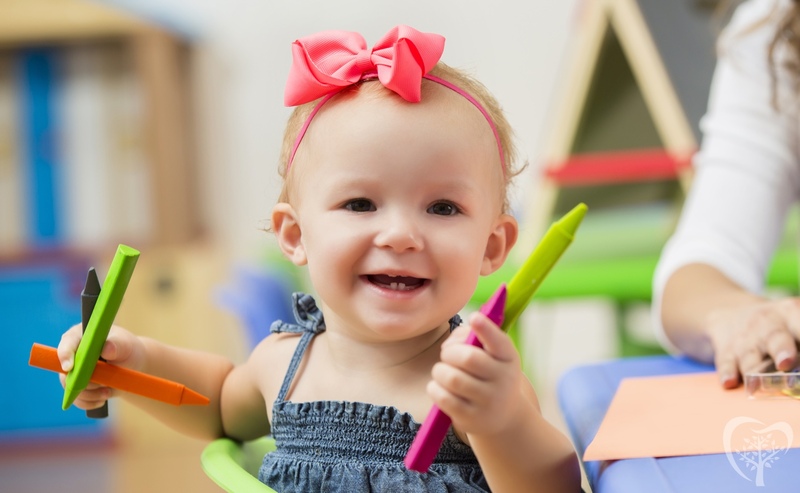 Parents should establish a dental home for infants by 12 months of age. 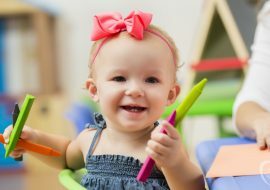 The initial visit should include thorough medical (infant) and dental (parent and infant) histories, a thorough oral examination, performance of an age-appropriate tooth brushing demonstration, and prophylaxis and fluoride varnish treatment if indicated. We love to see children at Lynchburg Family Dentistry. The main reason to see children early is so that we can catch small issues before they become big problems. Many times, cavities that would occur around age three can be prevented by giving the child’s parents sound oral health advice and applying a professional application of fluoride. We also use the American Dental Association’s Caries Risk Assessment form, which is simply a form that let’s us discuss habits and circumstances that make a child more prone to getting cavities along with what you can do to help make sure your child’s mouth stays healthy. Preventing cavities at an early age can put your child on the path to excellent oral health throughout life and can also ensure that your child doesn’t need to undergo invasive dental procedures under sedation. If you choose to join the Lynchburg Dental Plan, there is no charge for us to do exams, cleanings, and fluoride applications on children ages two and under. Has it been a long time since you’ve been to the dentist? In each dental office I’ve worked, I’ve spoken with a variety of patients about their reasons for avoiding the dentist. In most cases, whatever the reason was that they stayed away for so long, they told me that their visit went a lot better than they thought it would. Many people have a fear of the unknown and imagine the worst. At Lynchburg Family Dentistry, you never need to be worried about what we will think of your teeth. I’ve seen people with great teeth, and I’ve seen people with every tooth in their mouth badly decayed or infected. What’s most important to me is not the current condition of your teeth, but what we can do to improve them to get you smiling confidently again. We’ll never scold you about your oral health – we’ll simply be glad that you were able to make the difficult decision to come to the dentist. Talk to us about your fears. If you fear coming to the dental office, give us a call and we can arrange for you to come in and look around to get comfortable. If you worry about not understanding your dental treatment, we will explain it as thoroughly as we can. If you are afraid of not knowing what will happen at your appointment, relax — we will explain things until you are comfortable. There are often many ways to treat one problem, all with varying costs. We can go over all of your options to find one that fits within your budget. We also accept Care Credit, a leading healthcare finance company which allows you to pay for your dental work over a period of six to twelve months interest free! While dental insurance can make dental care more affordable; but if you don’t have insurance we can help! For those without dental insurance, we have set up a unique way to help you afford dentistry called Lynchburg Dental Plan. For one low yearly fee, you get your dental checkups, cleanings, x-rays, and fluoride along with a substantial discount off of our regular fees. We did this to help make dental care more affordable to residents of the greater Lynchburg area. While I can’t change the fact that I’m a dentist, we can help you with your fear. Many people have had bad experiences at the dentist when they were younger. If that’s the case, talk to me and let me know what I can do to help. For some patients, they appreciate it if I explain each step of the procedure as we go along. Others appreciate our extra-strength topical gel that takes away most of the pinch from the needle we use to numb your mouth. Still others prefer that I prescribe a mild relaxant that they can take before their appointment to put them in a happy dental mood. Like most problems, dental problems usually get bigger the longer you wait to resolve them. Whatever the reason you are avoiding the dentist, I invite you to come visit us and see how friendly we are. We really want to make sure you’re comfortable when you come to Lynchburg Family Dentistry. For many parents of young children, going to the dentist often isn’t at the top of their list of priorities. Others are unsure of what to expect. What will the dentist do to my baby on the first visit? Will my baby get scared and hate the dentist? Is there even a good reason to take my baby to the dentist? These are excellent questions. Hopefully the information below will give you an idea of what to expect at that first visit. 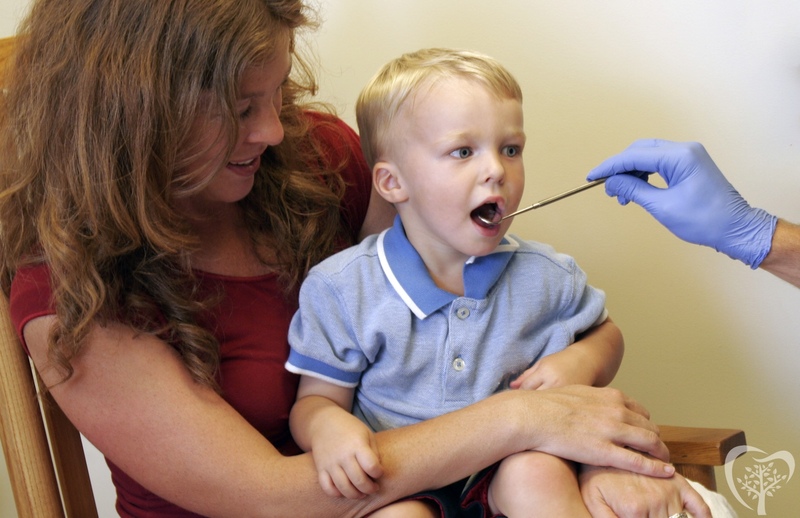 We provide a dental checkup, where we can check for cavities and monitor the child’s growth and development. 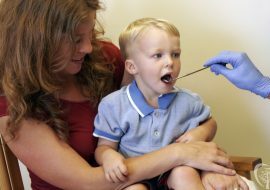 If the child has recently had an injury to his/her mouth, we can answer any questions and concerns and advise you on the best way to handle it. We clean their teeth. While some kids will let us brush, others may not. The important thing is that they’ve gotten the first visit out of the way and they’ll usually be more comfortable the next time they come back since they have seen our office and met us before. We apply fluoride varnish to help guard against any tooth decay. We go over any developmental and age-related information. This can include information on teething, thumb sucking habits, and how to prevent injuries the their mouth. This tool gives the parent valuable insight into what you’re doing well as far as your child’s oral health and we can go over any areas that need improvement. Our main objective of a first visit is to introduce your child to the dental environment and allow them to meet us. Whether your child handles their first visit like a pro or arrives slightly nervous, we are happy to give them a gentle introduction to the world of oral health.